One of my favorite things about summer is the arrival of the dragonflies. They grace us with their presence until early autumn and then we don't get to see them again until the following summer. Helpful and hospitable guests, dragonflies eat mosquitoes and gnats on the wing. On warm summer evenings right before sunset, if I look up I can see them zipping back and forth over the garden forming a canopy of sorts. Like our own tiny fleet of jet-fighters, they are waging and winning a war against the bugs we don't want and I rarely get bit by mosquitoes when the dragonflies are on patrol. Dragonflies and damselflies (a smaller cousin) like water sources, so they love our pond. They also like to have foliage that hangs over the water's edge. 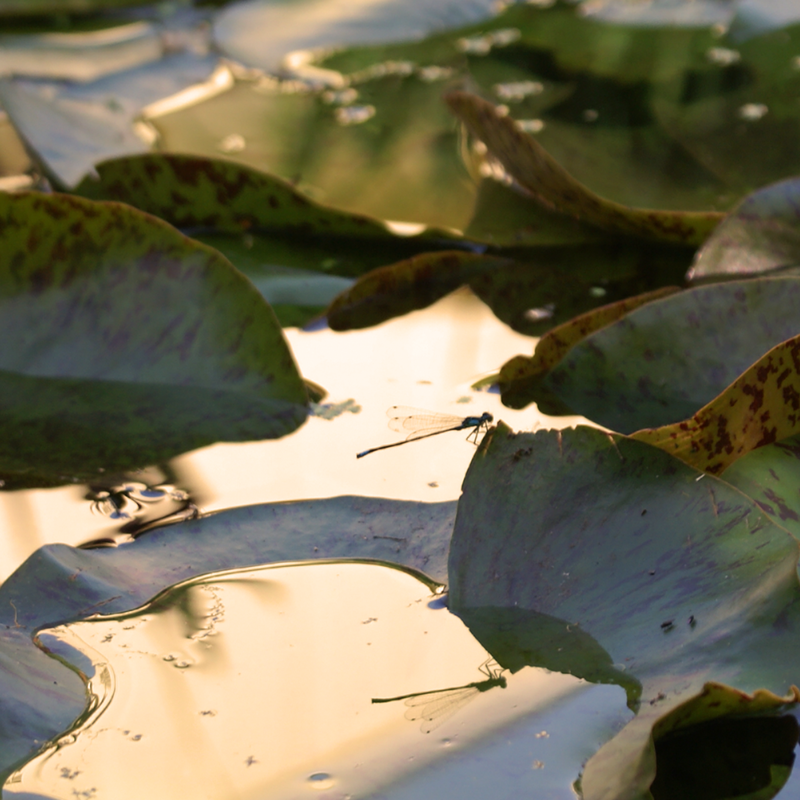 The large lily pads in our pond serve as landing pads for females to lay their eggs by hanging their tails over the edge of the pads into the pond water. Because our pond is kept chemical-free, dragonfly and damselfly eggs that get laid in the water eventually hatch into nymphs that burrow in the silt and sediment at the bottom of the pond to grow until they're big enough to go through metamorphosis and get their wings. Then they join their cousins that come from other nearby water sources to fly above our pond during the warm summer days and evenings. This is one of those seasonal cycles of life that I only discovered since building our garden so it was wildlife-friendly. 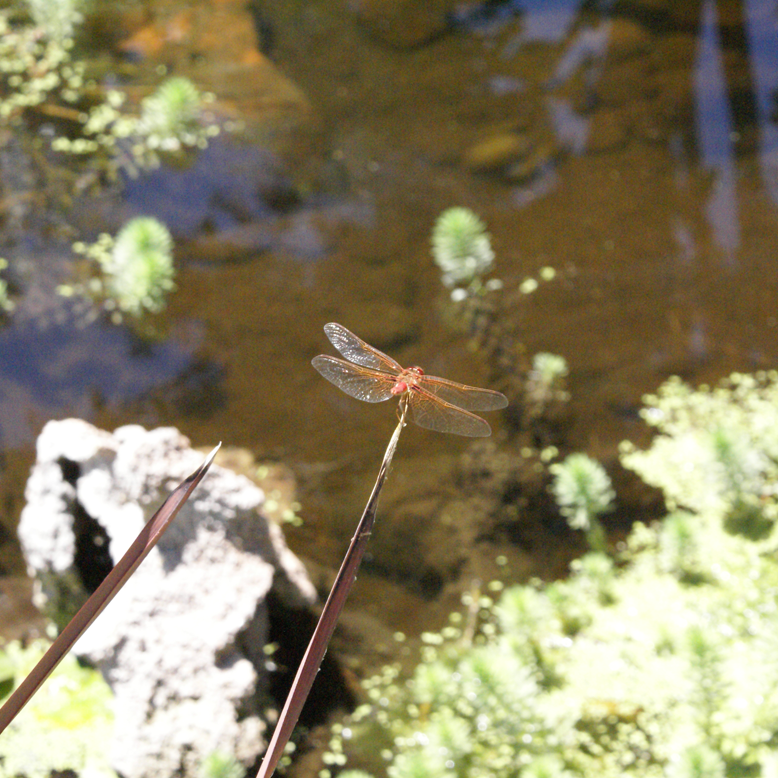 And the dragonflies of summer are something I have grown to love and cherish. I can't imagine summer without them now. They are gorgeous! Except I did kinda scream when I saw one staring at me today...but that's neither here nor there (I have an unnatural fear of flying things). Your camera is AWESOME.